Kia’s stepping up its game in 2011. Most recently, it unveiled its all new Kia Sportage, and if ever there was a car that was a far cry from its predecessor, this is the one. It’s got cutting edge styling with an unusual profile and roofline that looks terrific, and the new wheel designs that Kia’s using these days looks especially cool on the Sportage. 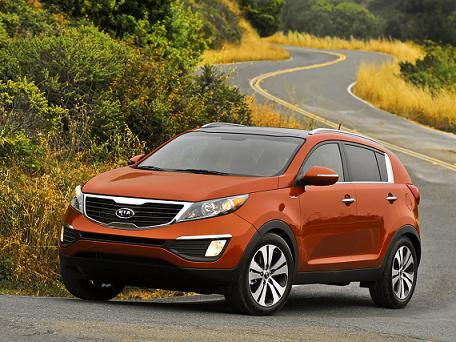 With its Kia family grille and aggressive side profile, the Sportage looks like a sophisticated--and expensive--urban cruiser, though the price is below what’ you’d pay for many of its competitors similarly equipped. You’ll probably think that the design looks vaguely familiar. That’s because it resembles the Kue concept that was on display at the 2007 North American International Auto Show in Detroit. You’ll notice an unusually high beltline, aggressive blisters over the tires, and really cool looking angles along the flanks that give the Sportage a sense of movement even when standing still. It doesn’t look like anything else in its field, and that’s a good thing for Kia. Up front, the Sportage uses “the new face of Kia, the brand’s signature grill, with dramatic swept back headlamps, tabbed grill outline and a distinctive lower fascia treatment,” a company news release says. “The dynamically sculpted hood, framed by a distinctive windshield design, adds to Sportage’s fresh appeal. The rear view offers a clean and contemporary look with pronounced unique tail lights set solidly within the rear lift gate.” Among the features and options you’ll see on the new Sportage include a panoramic sunroof, push button start, navigation, rear seat camera display, LED daylight running lights, and even air cooled driver’s seat. Later this year, look for a UVO powered by Microsoft in-vehicle communication and entertainment system. At first glance, i8t sounds like it will be similar to Ford’s Sync system. If this becomes a reality, it will be yet another indication that Kia is a serious player to be contended with in this field, particularly as it makes available these kinds of equipment offerings that you simply can’t get anyplace else in the compact SUV market. "An increasing number of consumers are craving and expecting connected experiences in their vehicles including being able to quickly and directly access music files, change radio stations and make or answer phone calls through voice or touch-activated controls," said Mukund Ghangurde, director of product management for Microsoft’s Windows Embedded business. "It’s exciting to see Kia Motors embrace the power of the Windows Embedded Automotive platform to deliver Kia UVO. We look forward to our continued partnership to deliver connected and engaging in-vehicle experiences for drivers." 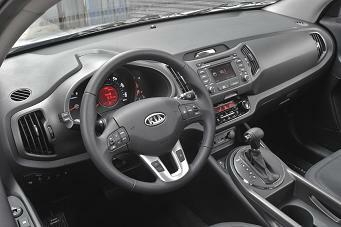 Kia says the system is an advanced communication and entertainment system (standard on EX models) that enables drivers and passengers to answer and place phone calls, receive and respond to SMS text messages, access music from a variety of media sources and create custom music experiences. HD Radio® also will be made available to enhance listening enjoyment. Available in three trims – Base, LX and EX – pricing for the dynamic compact CUV will begin at $18,295 for the base model, offering standard convenience features, including air conditioning, power windows, door locks and mirrors, SIRIUS® Satellite Radio capabilities with three months complimentary service3, MP3 connectivity and Bluetooth®4 wireless technology. LX will start at $20,295* and will include standard outside mirrors with LED turn signal indicators and privacy glass. Moving up to the EX trim level offers a beginning price of $23,295* with standard features such as 18-inch alloy wheels, leather-wrapped steering wheel and shift knob. Starting with the Base trim, Sportage offers numerous standard exterior features, including 16-inch alloy wheels matched with 215/70R16 low-rolling resistance silica tires, body-color door handles, body-color and electrically adjustable side mirrors and a 6-speed manual transmission. The LX adds side mirror LED turn signal indicators, keyless entry, and tinted glass. Moving to the EX trim offers more prominent 18-inch alloy wheels mated with 235/55R18 silica tires, roof rails, a rear spoiler and chrome body trim and door handles. 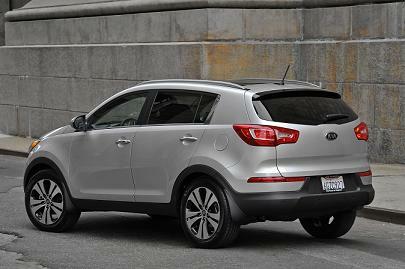 Available later in the model year will be the SX trim, featuring Kia’s all-new 2.0L turbo GDI engine. All LX models come standard with a host of convenience features including air conditioning, power windows, 12-volt power outlets in the front and cargo areas, power side mirrors with integrated LED indicators, tilt-adjustable steering wheel, keyless entry with panic alarm and multi-way adjustable front seats. Stylishly appointed cloth seats provide comfortable seating while 60/40 split-folding rear seats effortlessly accommodate driver and passenger cargo needs. If you get the EX, look for leather wrapped steering wheel and shift knob, telescopic steering wheel, illuminated vanity mirrors, automatic folding rear seats, a dual-zone temperature control air-conditioner with ionized filtration, illuminated and cooled glove box, and a power driver’s seat with lumbar support for additional comfort and support. Both trim levels come equipped with an active EcoMinder™ indicator for optimal fuel-efficient driving. Power for the Sportage comes from a 2.4-liter, 176 horsepower DOHC 16-valve four-cylinder engine with Continuously Variable Valve Timing (CVVT), which is rated at 22/31 miles per gallon. The Sportage can be had with either a front-wheel drive (FWD) or a Dynamax™all-wheel drive (AWD) configuration paired to either a six-speed manual transmission (Base) or a six-speed automatic transmission. The other big news for Kia is the all-new Kia Optima, which finally gets a fresh, unique design all its own without hints of elements of other cars on the road. You’ll be able to have Kia’s first ever hybrid in the country that will be part of the Optima lineup, along with two other all-new power trains. The new Optima is larger and wider than the existing model, which should put it on stance with other competitions in the mid-size family sedan field. “The all-new Optima is a new strand in Kia’s growing design DNA with a blend of simple and fluid lines and elegant but uncomplicated shapes that draw the attention of the eye in much the same fashion as a perfectly-tailored fine Italian suit,” said Peter Schreyer, chief design officer, Kia Motors Corporation. “From the distinctive sweeping chrome accent that stretches through the C pillars to the sleek greenhouse and flared wheel arches, every inch of the Optima projects a distinguished and refined style and extreme attention to detail.” Like the Sportage, the Optima gets its own version of the Kia family grille along with a much more coupe like roofline than it’s had in the past, giving the car a strong sense of sportiness. There are some interesting and visually pleasing character lines which give the Optima a fluid sense of motion, and it gets similar wheel designs seen on the new Sportage. 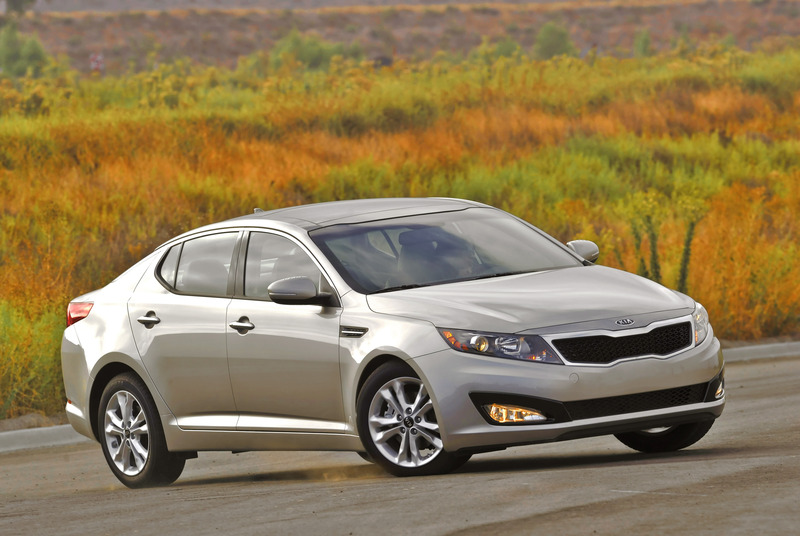 Available in three trims, LX, EX and SX, the 2011 Optima comes very well equipped right off the showroom floor. The LX includes dual exhaust with chrome tips, solar glass, outside mirror turn signal indicators and 16-inch steel wheels fitted with 205/65R16 tires. Upgrading to the EX offers standard fog lights, heated outside mirrors, exterior chrome/body-color door handles along with 17-inch alloy wheels with P215/55/R17 tires. Moving up to the SX adds HID headlights with auto leveling, LED rear combination lights, unique front grille design, rear lip spoiler, sculpted side sills, aero wiper blades, red brake calipers and 18-inch black machined finish alloy wheels furnished with P225/45R18 tires, achieving a true performance look. From the moment the door opens, Optima presents an immediate sense of a driver’s car. The instrument panel is contoured toward the driver to suggest a cockpit feel with precise gauges and controls for an overall sport performance experience without sacrificing comfort or roominess. Paddle shifters behind the steering wheel convey that Optima is built for people who are passionate about cars. A high console with a short shifter adds to the cockpit perception while an available panoramic sunroof provides an open-air feeling. Offering occupants both space and comfort with a number of standard convenience features, the sedan’s chic cabin unifies with the exterior design by welcoming its passengers with lean and ergonomic seat design and effective storage throughout. Modern standard features such as six-way adjustable driver’s seat with power lumbar support, illuminated vanity mirrors and a trip computer further expand the cabin’s luxurious qualities. In addition to offering a comfortable cabin, impressive technology features also come standard throughout, including an AM/FM/CD/MP3/Sat audio system with SIRIUS® Satellite Radio capabilities with three months complimentary service2. Also standard on all trims are auxiliary and USB audio input jacks for connecting with MP3 players and Bluetooth®3 wireless technology connectivity with steering wheel-mounted voice activation controls to enable hands-free operation for compatible mobile phones. Additional standard interior features include a tilt/telescopic steering column, power door locks, power windows, sun visor extension and an air-conditioned glove box. Stylishly appointed cloth seats provide comfortable seating while a 60/40 split-folding rear seat offers multiple seating and cargo arrangements depending on driver and passenger needs. Optima LX with automatic transmission features cruise control and an active EcoMinder® indicator for optimal fuel efficient driving. Optima EX comes well-equipped and offers premium standard features, including the UVO powered by Microsoft®4 infotainment system with rear-view camera, push button-start ignition with smart key, dual-zone automatic air conditioning with rear vents, a leather-wrapped steering wheel and shift knob, auto-dimming rear view mirror with Homelink®5 and compass, auto light control, driver and front passenger automatic window up/down and eight-way power driver’s seat, lighted glovebox, rear reading lamps, floor mats and chrome door handles. For consumers looking for even more sporty appeal, the Optima SX adds unique black leather woven seat trim, black interior trim with carbon insert film and metal accent, Supervision™ meter cluster with LCD display, center fascia and meter housing, soft trim with French seams, steering wheel paddle shifters, metal pedals and lighted metal door scuff plates. Available upgrades for the Optima EX and SX trims include a power panoramic sunroof, leather seat trim, memory driver’s seat, heated and cooled front seats, heated rear seats and a heated steering wheel for additional interior refinement. Luxuriously appointed features, including an Infinity®6 5.1 surround sound audio system with HD Radio®, and eight speakers delivering in excess of 500-watts of system power and voice-activated navigation system with a seven-inch screen enhance the cabin for audiophiles or those who seek the latest superior quality technology for a modern driving experience. 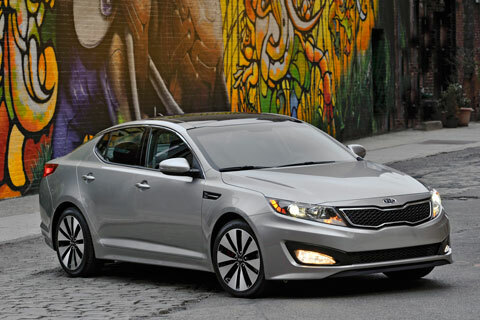 The 2011 Optima is available in three all-new and fuel-efficient Theta II powerplants, a 2.4-liter, 200 horsepower GDI four-cylinder, a 2.0-liter, 274 horsepower GDI turbo engine or a 2.4-liter hybrid. There’s lots of safety equipment that is standard on the new Optima, too. This includes six airbags (dual advanced front and front-seat mounted side as well as full-length side curtain), front active headrests, side-impact door beams, height-adjustable front seatbelts with pre-tensioners and force limiters, three-point seatbelts for all seating positions, Lower Anchors and Tethers for Children (LATCH) and a Tire Pressure Monitoring System (TPMS). Four-wheel antilock brakes (ABS), Electronic Stability Control (ESC), a Traction Control System (TCS), a Brake Assist System (BAS) and Hill Assist Control (HAC) also are standard. One of the more successful launches in recent months has been the Forte compact, sedan, which won applause from many auto writers for its contemporary styling, value proposition and the competite4nt way it handled on the road, particularly in how it steered. Now those that may be looking for a hatchback can find one in the Forte lineup. Forte five-door carries with it all the amenities of the Forte line and introduces a new front grille, alloy wheels, lower valence design, center console, paddle shifters, push-button start and navigation in addition to the ostensible fifth door for a distinct appearance and intentional practicality. Forte five-door is available with two efficient engines – 2.0-liter or 2.4-liter – and a new six-speed manual or automatic transmission. If you’re thinking that you’ve been seeing more new Sorentos on the road, you’re right. The all-new, elegant Sorento for 2011 has been popular with consumers since its introduction, and it represents a big improvement over the prior model. No longer built on a truck chassis, the new Sorento is now based on a unibody platform, It has a pretty solid ride, and offers comfortable, reasonably priced accommodations for families with kids with its seven seat design. Based on the KND-4 concept shown during the 2007 Los Angeles Auto Show, Sorento can be distinguished by “the same swept-back lines and dynamic presence as the concept KND-4 vehicle,” a company release says.. Available in base, LX and EX trim levels, standard equipment on Sorentos includes he versatile CUV offers tasteful exterior features on all three including 17-inch alloy wheels with 235/65R17 tires and wheel moldings, while moving to the LX trim includes standard body-color heated outside mirrors with integrated LED turn signal indicators. All EX trims offer standard 18-inch alloy wheels outfitted with 235/60R18 tires, automatic headlamps, fog lamps (optional on LX trims) and a rear spoiler. Optional for LX and EX trims are roof rails for those looking to spend a weekend away or endeavor in recreational activities, while EX trims offer the options of 18-inch ultra bright mirror-finish wheels or a panoramic sunroof (V6 models only), a first for any Kia vehicle. The 2011 Sorento offers two engines, including a 3.5-liter V6 providing 276 horsepower and 248 pound-feet of torque and a 2.4-liter four-cylinder engine producing 175 horsepower.